A couple of weekends ago on a particularly lovely day, Hubba Hubby and I finished up our chores early and decided to go for a walk. 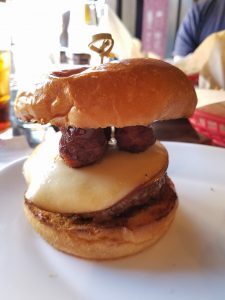 Left Bank Burger Bar — directly across the street from Jersey City’s Barcade — caught our eye as we’ve walked by plenty of times and heard lovely things about it, so we checked the menu out and went inside… and sat by the window with great lighting. I decided I wanted a bunch of snacks to make up my meal, so I started with fried pickles. I really liked these – they arrived piping hot but not “burn the life out of your throat” hot, and were crunchy bites of delight. 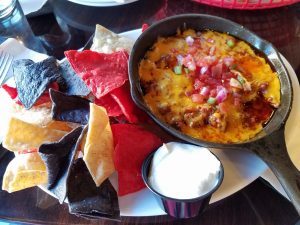 The cole slaw on the side was nothing interesting, while the dilly ranch was great for dipping the pickles. I vastly prefer fried pickle chips to spears, too, so this worked out really well. Hubba Hubby enjoyed them as well (he keeps insisting he ate most of these, but I don’t think that’s accurate). 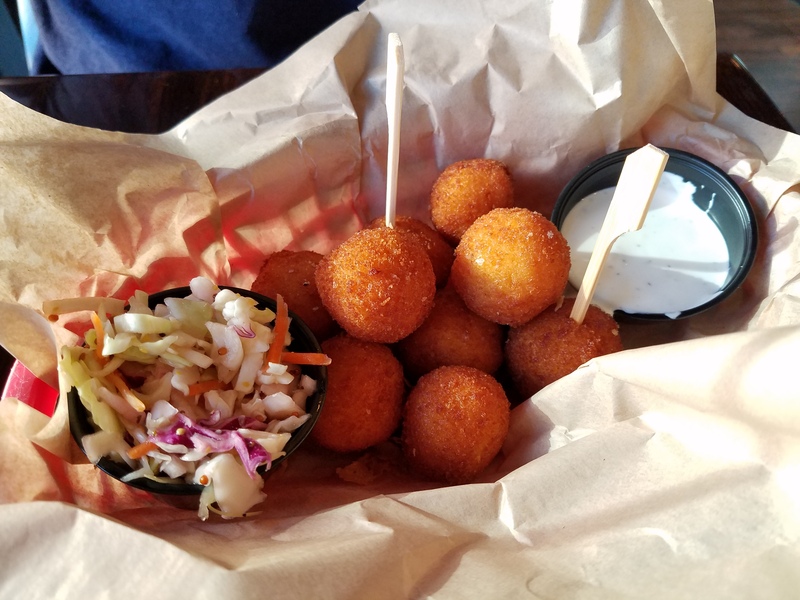 Next up – fried mac n cheese balls!! Same slaw on the side. 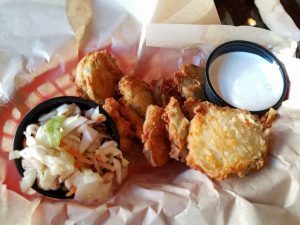 These were also fried really well – it seems like they know how to fry, which is always a plus for me at bar-type places – and expertly crisp on the outside. The inside wasn’t quite as gooey-cheesy as one might like, but satisfactory bits of mac-n-cheese (which is an actual dish on their menu as well, one they boast about) that went nicely with the ranch on the side again. I don’t know that I’d order these again unless I was drinking — two fried dishes together was just a touch too heavy for me, and I know I’m going to want those fried pickles again! Hubba Hubby went straight for the spiciest burger on the menu : Ghostface Killah!! Pic taken from Hubba Hubby’s angle. Bonus: I’m in the background, haha, pink FitBit visible. Umm, guys, the description from the menu says: espresso-rubbed patty, ghost pepper jam, smoked gouda, sweet potato bacon tots, red onion and mustard BBQ sauce. I don’t think it clocked in at ‘very spicy’ on Hubba Hubby’s scale (he eats very very spicy food without blinking), but he said it was really good and he thoroughly enjoyed it. The combination of the components really added up for him — most of those are things he really likes, so they definitely made him happy. 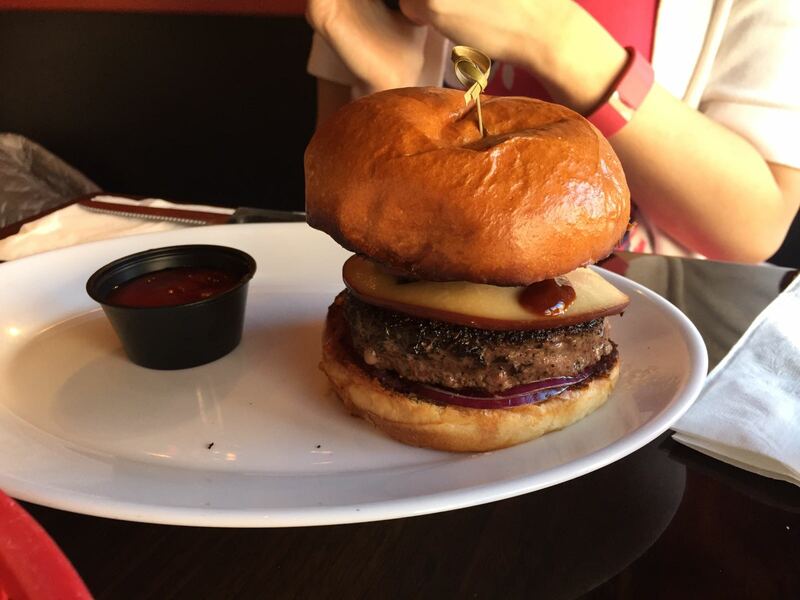 I’ll definitely be back to try other snacks and perhaps some of the other burgers on the menu!! I enjoy having such a fun place so close to home. It was a little loud but service was friendly and quick, and everything had a super casual fun vibe to it.